With help from our interactive Newton Nissan South website and Shelbyville, Tennessee, location, motorists can enjoy the hassle-free, streamlined vehicle loan, trade-in and service processes that they deserve. Our new and used car dealership is committed to ensuring all our customers can enjoy a high level of care, so don't hesitate to get in touch with our staff no matter what your auto needs may be! The Nissan brand is known for its intuitive designs, innovative safety systems and high-tech comfort amenities, so if you're searching for new cars for sale near Franklin, TN, drop by to see us today! We can review the features a new Nissan Sentra comes standard with or the comprehensive warranty an adventurous Rogue is backed by. Use our interactive website to shop all our new Nissan models and don't hesitate to schedule a few test drives once you've found LEAF trims that complement you. When it comes to used car shopping, you'll be hard pressed to find a trusted dealership that stocks more well-maintained models than we do! 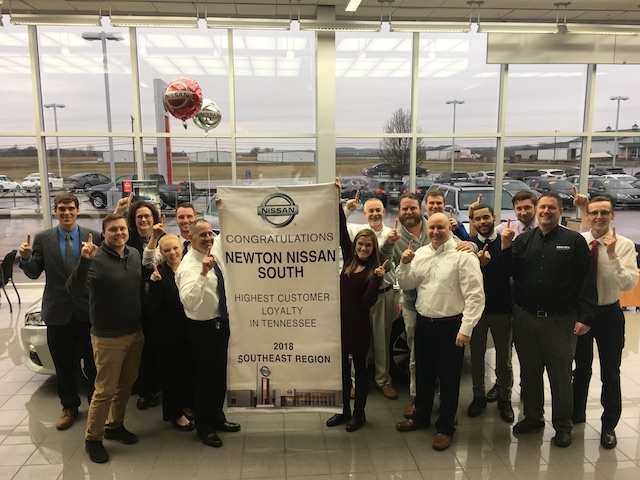 Here at Newton Nissan South near Lewisburg, TN, we not only have used Nissan vehicles to explore but stock certified pre-owned Nissan options and used cars for sale from other reputable brands. Talk to our Nissan sales department about your needs. We'll customize a shopping experience that introduces you to all the models that complement your needs. With help from our auto appraisal form, motorists can value their trade-in to determine if now is the time to upgrade to one of our used Nissan Titan trucks! If you're a new or used Nissan shopper near Manchester, Tennessee, who is interested in financing one of our vehicles, our loan professionals are here to help. Our finance department has helped many drivers secure competitive terms, and we invite you to submit one of our credit applications so that you can learn more about your options. From buying versus leasing information to online payment calculators, material on different Nissan programs you can take advantage of and even loan options for sub-prime credit ratings, there's a vehicle financing solution for you here at Newton Nissan South. Our auto service center employs professional, certified technicians who can complete maintenance work on a variety of vehicle manufacturers, so use our online form to book an appointment no matter what brand of car you drive. We'll be sure to use genuine car parts to complete all work after reviewing any service specials you can put to use. We also offer a dedicated parts department so that all those who are looking to complete auto work at their Tullahoma, TN home can acquire all the genuine car parts needed to get the job done safely. Visit us for a customized original equipment manufacturer part shopping process or use our convenient form to order genuine Nissan parts now! Why Shop Our New & Used Nissan Dealer? In addition to the professional sales, finance and service assistance we provide, our new and used Nissan dealership near Murfreesboro, TN offers our Newton Advantage Lifetime Warranty and Carefree Maintenance Plan complimentary to all those who purchase a new Nissan from us. Add to that the fact that we boast Nissan Express Service, customer-centric processes and competitive prices, and you've found your go-to auto dealer! Visit us in Shelbyville or shop our online resources today.